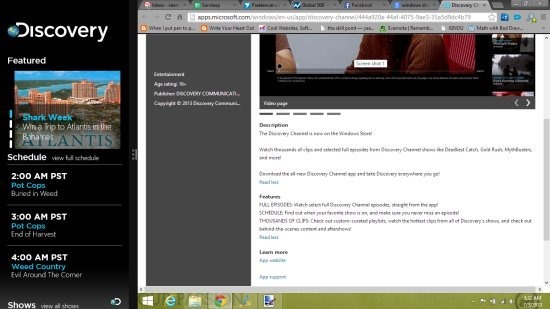 Discovery Channel is a free Windows 8 Discovery Channel app; available in the entertainment section of Windows Store. This app is an official app by the Discovery LLC. Watch your favorite discovery videos using this app and catch up with some good shows like: Street Outlaws, Gold rush, deadliest Catch, etc. You can also check the schedule of the shows on that day and for coming days also. The app needs your internet connection to load fresh videos. So, check out this new Discovery App on your Windows 8 and have fun. 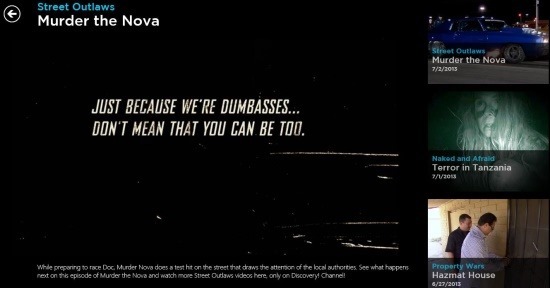 Discovery Channel app is feast for those who love watching Discovery Channel. 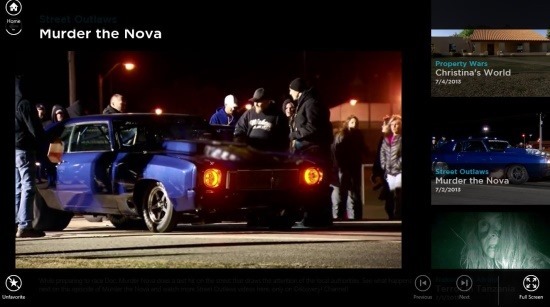 Believe me, I started testing and watched a whole episode of Street Outlaws show, before writing this review. The interface of the app is also simple to use. The app is divided into various categories like: Featured, Shows, Schedule, Full Episodes, Videos, Playlists, and Favorites. Featured: This section shows you a list of featured episodes for you to read about. Also watch more suggestions indicated beside the video. 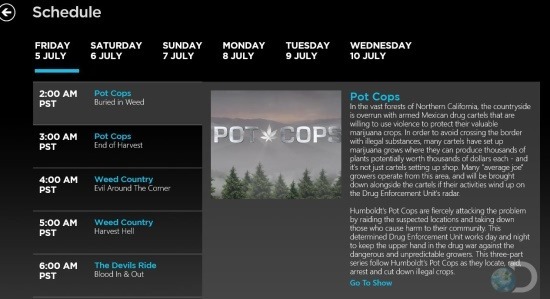 Shows: In this section you can search for any show that is hosted on Discovery Channel. Click on any show and you can watch the episodes of that show there. Schedule: The app shows the schedules of the Discovery shows in this section (refer to image below). The show timings, dates, and days are also indicated. 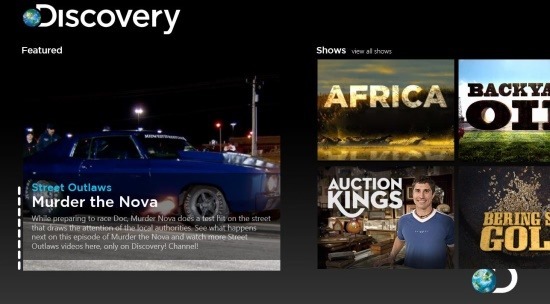 Full Episodes: The app features videos of Discovery Channel shows on your Windows 8 device. You can watch full episodes in this section. Videos: In this you can see videos of popular shows. Playlists: In this category you can view playlists of TV shows. Favorites: In this section you can view the videos that you have marked favorite. This app is available for free on Windows store. Watch full episodes of all your favorite shows from your Windows 8 device. Follow your favorite shows by simply viewing the Schedule category. Watch all episodes and full videos from playlists and also using the playback options. Mark your favorite videos to view later. Just click open this link and click on View in Windows Store, then the app opens in the app store. Just click install and start using this app. Also try: How Stuff Works App and Stanford University App to gain more knowledge by watching videos.